I have always envied bloggers who get all the ingredients they need for their recipes. However my hubby thinks otherwise. He claims that if I did have access to all the ingredients I’d be living in my kitchen,he would put on weight and my neighbors would not prepare food in their homes! Well, that’s not entirely true. There are days when I don’t even want to lift a spoon, forget about preparing anything. At that time making a simple khichdi too becomes a humungous task. Since Srivalli announced the Mega Blogging Marathon theme, Veena a co member and blogger asked me why I wasn’t taking part. I told her that I definitely will not manage preparing 26 dishes for this theme. After a few days I changed my mind and wrote to Srivalli. I wanted to take the challenge up and also because my daughter and I are always looking out for vegetarian protein rich dishes to have for dinner. From the time Srivalli approved, I hadn’t started planning or making anything. When I was in Montreal, 3 weeks flew by because my dad came over from London, his first visit to Canada. So days went in taking him to different touristy places, cooking his favorite meals. As and when I had time I did my research and went through my bookmarked recipes as to what I wanted to try but didn’t have an specific plan or sub theme in mind. I just knew that I was going to try and make a dish with every protein rich vegetarian option there is. So far so good. One of the ingredients I wanted to work with was cheese. We all know that though cheese is a very good source of protein and calcium, high consumption is not too friendly on our hearts. Its during my research I found out that compared to lesser known cream cheeses, Philadelphia cream cheese is rich in protein, from 1 cup you get 39g of protein. However, you can’t eat a whole cup of the fat loaded cheese. I knew one of the recipes for the Protein Rich theme was going to be a cheesecake or something with those flavors. Walking through the freezer section looking for some fresh orange juice, I saw a packet of phyllo pastry. I immediately picked it up and knew what my cheese cake base was going to be. Hubby thought he would be getting crunchy miniature spring rolls! I’ve had baklavas and other phyllo pastry based dishes during my visits to Dubai and phyllo cup cheese cakes idea comes from the dessert that was served at Double Tree, a mousse to be more precise. They had made the mousse in small round phyllo cups. I couldn’t find the cups but hey I was just happy to get phyllo pastry! Its like when a little girl walks out of a toy shop with her favorite doll or tea set (do they really play with those things anymore????). Brush a muffin tray with oil lightly. The pastry I bought had about 15 sheets. I unrolled the pastry sheet and cut through the layers. Cut the pastry into squares about 4-5 in length. Take 4 to 5 sheets and place it in the muffin tray to create a cup. This way from one square I could make 3 cups. Cut squares till you’ve filled all 12 muffin cups with the pastry. Bake for 15 mins or till the pastry cups become light brown in colour. Take the muffin tray out of the oven. Carefully remove the cups onto a wire rack and let the cups cool down completely. Store them in an airtight container till required. Put the yogurt, cream cheese and milk or cream into a bowl. Blend the mixture till it becomes smooth. Put it in the fridge to cool till required. Spoon about a tablespoonful of the cream cheese mixture into the phyllo cups. Arrange chopped fruit over the cream cheese. Dust icing sugar over the cups and serve immediately. If you want to you can replace the yogurt with cream cheese… I just felt too guilty! Add fruit of your choice or add nuts, grated chocolate. 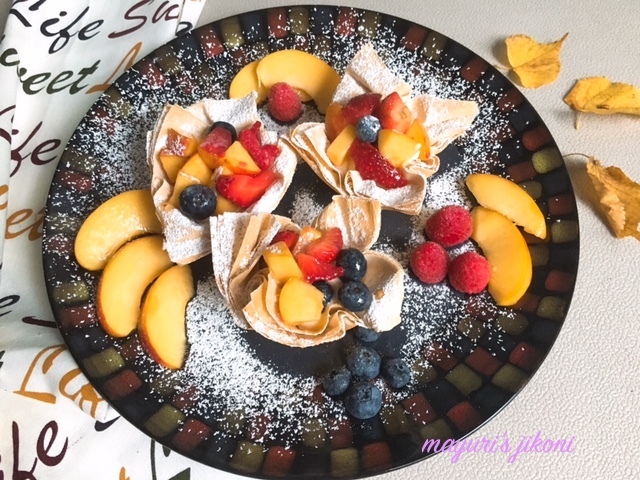 A great party dish as you can prepare the phyllo cups a few days ahead. That is such a gorgeous dish, Mayuri and you have plated it so beautiful. And kudos to you for coming up with so many dishes with limited availability of ingredients and hectic travel schedules. What a fancy dessert for the protein Rich theme ! Wow ! You are right we are happy to get special ingredients , just like little kids . New ingredients , rare ingredients always excite us . This is such a nice way of using phyllo pastry. Guess we need to assemble this at the time of serving else it may get soggy, right! Awesome presentation..
Gosh those cheesecake cups look divine!..you had me laughing at your neighbours need not cook part!..hahaha..very funny really!..I hope all of you haven't put on weight because of this marathon.. Cheesecake cups look colorful and kids would love it for sure.I am literally drooling over the pictures. Oh my that is a sinful looking phyllo cheesecake cups. Love the vibrant colorful fruits there. I love philly cheese soo. They are so creamy and I love them on sandwiches. These phyloo cheesecake sounds like a perfect party dessert. Will definitely try it. And I can so relate to your first paragraph. There are days where cook a storm and there are days where don't even do anything. I guess all need a break. Lol all food bloggers are the same. I know I will prefer shopping at the supermarket or sabzi Mandi to clothes. As for the cheesecake it's beautiful. Making me hungry. Cheese cupcakes looks sinful.. Yummy snacking and lovely presentation!! Thats a smart way to prepare some cheesecake cups with Phyllo sheets and the plating looks super catchy Mayuri. Lol even i wasnt ready for the challenge with 6weeks stay in India, i couldnt even plan earlier, however managed and ready to post 26 dishes now. Cheese cake in whatever form it is. I am all in luv with this recipe. Beautifully plated and presented Mayuri.